Christina: Tell me a bit about your experience as a plus size woman who is modeling. Katie: I wanted to be a model from a very young age. Even though plus size modeling wasn’t a very popular thing, I went to a few open calls when I moved to New York. And when I was interning during college, I went to castings – I very much wanted to be a model. Something funny is that 4 years ago when I got the opportunity for that to become a real thing and I signed with an agency, I realized that I don’t actually enjoy modeling. When I was pulling clothes for you, I learned that there’s still a real lack of options, and particularly luxury designer options. Can I ask you to speak about that, from your experiences dressing yourself to modeling on set? I feel like you found out what it’s like…to think that you’re going to have a vision for something, and then you have to choose the best of the worst to make that vision come true, because it’s not happening the way that it would if you were a straight size person. For me, that moment frequently happens on set, where you see someone’s vision not come true. But, you did a great job! I’ve been on too many shoots where I can see that they wanted to do this whole thing and then it ends up just being a dumbed down version. Or, they’ll say, let’s just put you in a white button down with no pants. They take away all the clothes because they can’t get any of the clothes. I noticed that too. I was looking at other shoots for inspiration and plus women are so frequently shot in lingerie and swimwear because I think there’s a lack of options and a lack of creativity. Through the eyes of a straight sized stylist or fashion editor, a lot of the times the looks that they think they want to do don’t look the way they want it to look. So, they just scrap it! For example, you pulled a Sandro men’s piece. It was a men’s X-Large shirt. We’re both thinking that it’s an option, but then you find out that the sizing is so fucked, that I’m bigger than Sandro’s biggest man! Right! That’s so crazy and particularly with designer brands where the clothes tend to run really small, even the men’s clothes. That was surprising. Correct me if I’m wrong, but it seems like the sizing can get so screwed? You might fit a certain size from one brand and not the same size from another. It seems like it just gets worse and worse. Oddly enough, as we are moving towards getting better, it also seems to be getting worse. Maybe because people are experimenting with different sizes that they haven’t tried before? Or maybe they don’t have the right consultants on their team. What do you think? I really don’t know, especially in straight sized brands, I feel like everything is just getting smaller and smaller. Or I’m getting bigger and bigger. I just don’t know. It’s ironic, given that women aren’t getting smaller and smaller. To change the subject, can you describe what you consider your personal style to be? My personal style is like a Japanese kindergartener. It’s like a school uniform, preppy, but with cartoon monsters on it. For this shoot, we really wanted to play around with dressing you more like the aesthetic of our site – which is very French-girl, dressed-down, very minimal. I think we ended up somewhere in the middle – as I was editing the clothes, I didn’t want it to feel so cliché. I also noticed as I was pulling in the plus market, there seems to be a lot of poorly designed clothing! There’s not a lot of sleek or minimal designs. There’s a lot of distraction. Right! If you have a clean piece of clothing, 99% of the time there is a bad detail. Another thing I noticed is how some designers claim to make plus size, and then really don’t. Yeah, it’s like you’re technically offering up to the average size American woman, but that’s not extended…. It seems like a lot of places have one or two plus size items. Hopefully, they’re just getting into it and they’ll start making more, but right now, it seems a bit half-assed from some people. 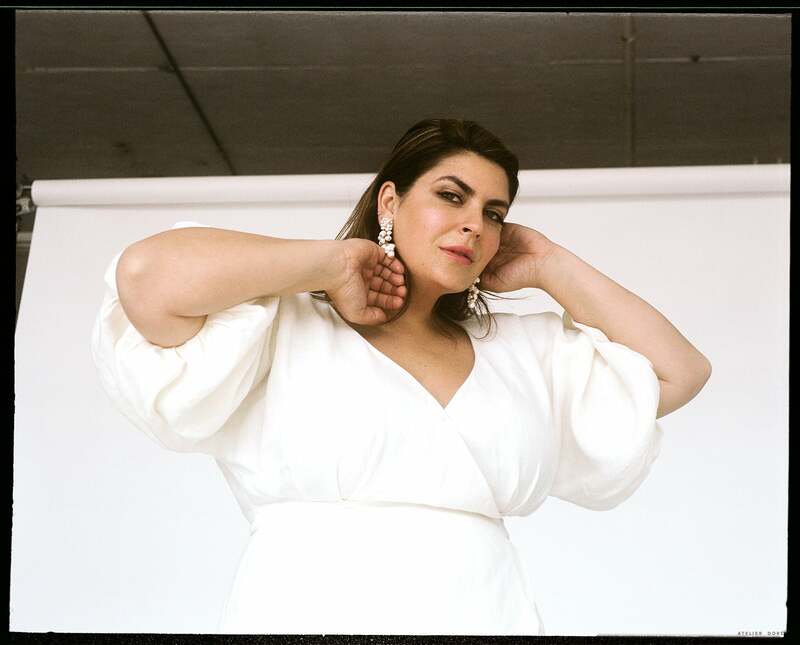 When I thought about wanting to make this a fashion story where we just focused on the fashion, I thought, ‘maybe we shouldn’t talk about plus fashion at all in this interview.’ But, we spoke about it on set and it felt like we wanted to address it. I’m curious, how do you feel about always having to talk about plus size clothes and plus size women? Do you like that you’re able to be a voice? Or, do you wish you could focus on other things? What’s your take on it? I think that I’m in a bubble where it seems like we have made a lot of progress and there is a lot of movement in the industry, when in actuality there hasn’t been. If you look on a board graph scale across not just fashion, but media, and the images that we see, the majority of brands out there are still overseeing people. The scale barely tipped. There is a lot of noise so I feel fortunate about that. I know that a lot of people are like, ‘yeah, it will be a good thing when I don’t even have to talk about it, you’re just featuring me for my style, not my size.’ And I guess that is true, but I just think that we’re really far away from that. So for now, it’s still important to call it out. I think so too. Tell us some of your favorite brands and some things in fashion that you’re excited about right now. I wanted to ask you about that too, about ways that you’re wearing designers that you love, but that don’t necessarily make your size, or just creative solutions to things. If you find that jackets fit you from a certain brand, for example, is that something you keep track of? Yes, I buy Saint Laurent Men’s boots. I just bought a pair of cowboy boots from Chicoma. I think it’s a new brand. I bought men’s in those shoes and they’re very beautiful. I wore the men’s BLK Denim leather jacket for a long time. I never considered men’s Sandro, that’s why I was so into that shirt you brought. That’s why I brought it up because it’s fun to discover new things like that. So, yes, I will check a unisex piece for sure. And by unisex, I mean, I’ll check if they make a men’s version of the women’s thing that can totally pass for women. That’s something I ended up falling into when I was pulling for this shoot. I just have to say, as a stylist, I think you did a really great job of dressing my body and most straight sized stylists and editors do not do that at all. Thank you! That means a lot to me. I don’t know what would’ve made me better than anyone else except that I did the research and put a lot of thought into it. No, I think it’s a skill because you have an understanding of something that most people don’t. I’d like to know where plus size French women shop! We might be smelling a story here! That sounds really awesome. If you’re interested to work on that story at a later date, I’d love to help with that! Super article mais qui dit quoi dans l’interview? Hi! We’ve added names to the beginning of the conversation to help this. Christina’s questions are in the bolded areas, Katie’s responses are unbolded. Gorgeous! I was so happy to see this post this morning. Love it. I love this article and I hate it! It’s great to finally see a woman that represents 68% of women in the US. And I agree with you both that we still need to have the “plus size” conversation… but you are preaching to the choir. Basically what I’m saying is can we celebrate normal sized women for the beautiful individuals that they are without having to shine a spotlight on the fact that they aren’t skinny. And if you want to make a real change… write to the editors and creative directors of the brands and stop beating us, readers that aren’t making any decisions at these design/fashion houses over the head with the same tired message. As a size 10-14 (who even knows anymore?) woman who used to live in Paris- shopping was insanely depressing and even worse than the US. I can’t even honestly tell You any high end French labels that have an extended size range. Such an interesting read. There is a rumor in the fashion world that it’s only for skinny people, but fashion is for everyone. I personally love to see all types of body-shapes rocking the latest trends! Katie looks absolutely gorgeous in these photos. My favorite look was a white dress by Mara Hoffman and pear-drip earrings! So elegant! But why-oh-why those heavy, hulking, graceless black sneakers with the floral dress? Et les marques scandinaves et belges tendent (à mon expérience) à tailler plus grand que les autres. Le probleme avec les marques de vetements – en tous cas pour la plupart des marques françaises – c’est que si on sort de la “norme” cad des tailles 36-38-40 (tailles T1, T2 et T3 Fr) on a un mal fou pour s’habiller. Je fais un petit 34 et j’ai très peu de poitrine, j’ai autant de mal pour l’habiller que Katie. Et même en allant voir des marques faites au départ pour des jeunes filles (Soeur par exemple), leur taille 34 est bien trop grande, alors que chez Claudie Pierlot, un jeans T34 peut être trop petit serré pour moi. Great feature and beautiful styling. I find it very hard to have clothes that look good on me, with a wonderful drape, design and GREAT fabric. I am a 12, in my 50’s & find so many limitations. I wanted to make a comment about the european women, size and culture. I spend summers there, the food is different than in the US. Less of something for sure. A friend recently commented about a trip of 10 days in Italy that he and his husband lost 13 and 6 pounds respectfully and they were eating pastas, bread, wine etc..what is it here. The size of our portions (for sure), or additives we put in the foods? anyway, great feature and beautiful images. There is definitely something in the food in the US.. sadly!! I am from Canada and you’d think it wouldn’t be be that different but we have different laws about what can be put in food and after a 2 week trip down there I just felt awful and really bloated, even after cooking our own food. Couldn’t put my finger on it but was a relief to get back to ‘normal’ food. Honestly I liked the food but I swear it is different in some undefinable way. Feel for you guys. Never had that issue living in the UK either. Anyway a bit off topic here so I’ll go now!